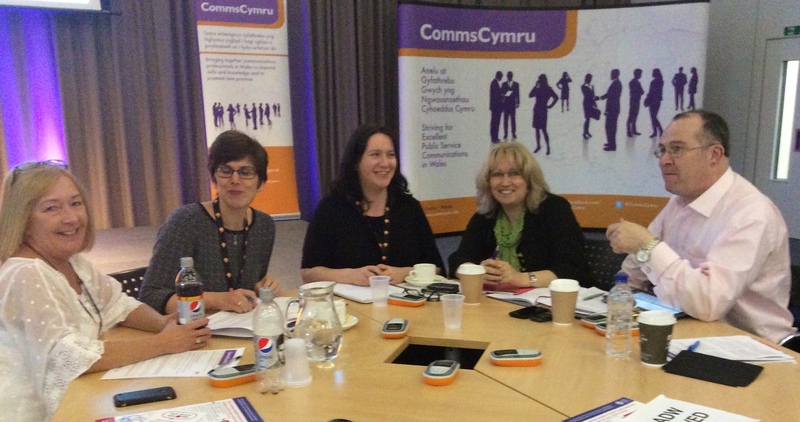 The key communication lesson for me from the recent CommsCymru spring conference held in Swansea was how we can help each other in the public service in Wales with campaigns and generating fresh ideas. The session ran by Caroline Black @caroblack on low-cost campaigns was innovative and very inspiring. But for me its key lesson was how we actually do hold the expertise within ourselves. This was illustrated when Caroline got us on our tables to band together and dream up campaigns. Most tables took a real issue facing one of the delegates and helped come up with campaign ideas. These ranged from a council looking to switch off its street lights, to the Welsh Language Commission campaign for employees to display that they can speak Welsh. There were intense discussions taking place around the room and what was apparent was how liberating it was to be freed from the shackles of trying to think of ideas in the workplace for our own employers. The feedback sessions showed some really innovative thinking and what sounded like excellent campaigns. It would have cost a fortune to have paid agencies to have developed the ideas generated for free during the course of an intensive one-hour session. The cliche of private good and public bad is much bandied around the media at the moment and Caroline’s session proved this is as untrue in Wales as it is anywhere else. In a previous life I was a facilitator for trade unions and the participants always had the answers themselves and the trick was to help them draw their knowledge out. This will sometimes be possible to do in-house within our organisation’s communication team. That is more difficult for smaller teams, and especially where there is just one solo communications person. However, the real lesson was how people from other organisations bring a fresh perspective and really good ideas. Those conference participants who were given real help with their campaigns now know that their public service colleagues are a valuable resource. But how do we reach out to each other to get that help when we need it? Finding the time is one problem, while another will be convincing our organisations of the value of receiving free help. The ethos of sharing and helping is a key objective for CommsCymru. The challenge for the steering group is to consider how the network can be used to help each with generating campaign ideas. This is a really thought-provoking article.